Oil Creek Ditch Company Included! Galloping Fish is a unique find with both the Arkansas River and Fourmile Creek at its boundary lines! Imagine fishing from the banks of your own private shorelines, soaking in the 300+ days for sunshine, watching the river flow by or enjoying the lovely views of area mountains! The property also boasts of a natural campsite formed by mature Cottonwood trees that is situated at the edge of Arkansas River. The terrain is flat, with elevation of around 5200 feet and a growing season starting in April and ending in October – it is a great place for farming or ranching activities. 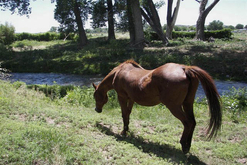 Utilize the existing irrigation ditches to shape it into an upscale working farm and ranch, riverside retreat or equestrian facility. The property currently has agricultural zoning with no covenants. One of many building sites could be chosen to start that dream home or getaway cabin. Underground electric and phone are at the property line and access is from paved city streets – just off a cul-de-sac that provides end of the road privacy. Additional and adjoining acreage is also available. The property is located just beyond the Canon City limits, it offers year-round recreation with mild winters, numerous amenities and nearby attractions; including more than 7 miles of equestrian and walking trails on the Canon City River Walk. Galloping Fish offers an extraordinary opportunity to own riverfront property where you can fish, hunt, farm, ranch, build or recreate!